Dual Redundancy: Great Scott! A Back to the Future Musical?! This is heavy. Great Scott! A Back to the Future Musical?! This is heavy. 2015 is the year Marty traveled to the future in the first sequel of the Back to the Future trilogy. It is a year filled with self-lacing sneakers, hoverboards, and… a Back to the Future musical? Last night news broke and was soon confirmed by the official Back to the Future website that the hit 1985 movie starring Michael J. Fox and Christopher Llyod is headed to the Broadway stage! 30 years after the Universal film mesmerized audiences in the movie theater, now the story will be told on the London stage before it (time) travels to America. Both Robert Zemeckis and Bob Gale (director/co-writer and producer/co-writer respectively) are working with Universal Stage Productions, Colin Ingram (a London based producer) and Steven Spielberg’s Amblin Entertainment for this production. 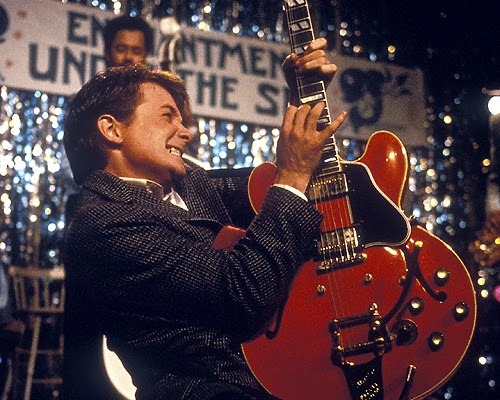 While new music will be added, original composer Alan Silvestri is back and iconic songs like Huey Lewis & The News’ “The Power of Love” and Chuck Berry’s “Johnny B. Goode” will be incorporated.